This mod isn't the most user-friendly mod out there. If you are new to modding Fallout 3 mods, please click on this text for a great tutorial on installing mods. If you install other mods, this mod may conflict with them. It's because of the way the Fallout 3 engine is set up. When I edit the face of a character, it edits the Character Record (the games "definition" of the character: their behavior, equipment, voice, appearance, basically the entire character). When two loaded mods edit the same record, the game will draw data only from the more recently installed mod's record. We call this a mod conflict. This is resolved by a compatibility patch: a new plugin which edits the conflicting records and merges their changes. I literally redesigned the ENTIRE world of Fallout 3... so this will clash with other popular mods. 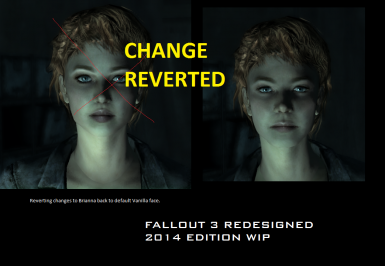 ArchiveInvalidation Invalidated is needed in order for Fallout 3 Redesigned to work properly. It fixes the "Albino" skin issue. This mod is for your own personal use only. You may not redistribute any of the contents in this package, or re-release any of the contents, without my permission, or in the immortal words of Samuel L. Jackson, "I will strike down upon thee with great anger and furious vengeance." You may however edit your copy to your pleasing, so long as you don't re-release without my permission. By downloading this file you agree to these terms. What exactly does this mod change? 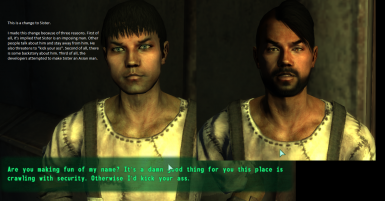 Nearly 500 NPCs have been redesigned in Fallout 3. Companions, children, Talon mercs, the Brotherhood, slavers, settlers, raiders, named NPCs, the random straggler walking on the side of the road, etc. 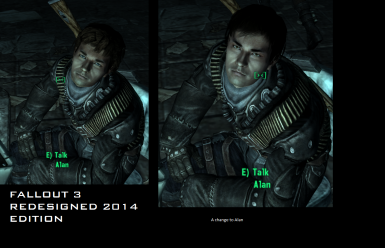 I am an avid fan of Fallout 1 and Fallout 2 and this has helped me in making the characters fit the lore of Fallout 3. I also have had experience in the past with character design and with portrait drawing and this has helped me a tad with figuring out the right proportions for characters in Fallout 3. If there was a face that had to be fixed, I saw it. And I tried my best to fix it. I may not have succeeded but I saw it and I tried to fix it. 2. 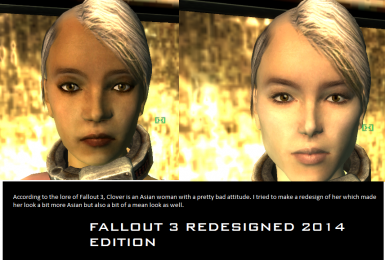 Choose either the HD version or the standard version. 3. Download whichever version you chose. 4. Extract them to your /Fallout 3/Data/ folder. 5. Activate Project Beauty.esm and any other plugins you wish to use. 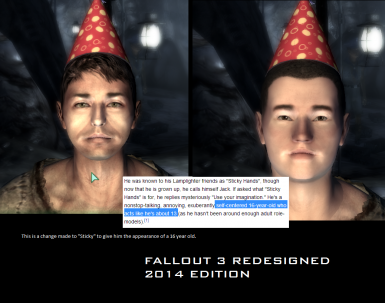 This mod will conflict with any mod that edits NPCs. 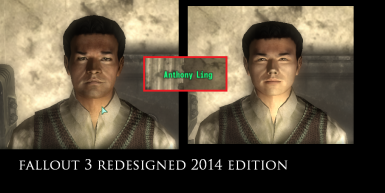 If you try to use Redesigned along with another mod that edits NPCs, you will either miss Redesigned's faces or the other mod's changes. Because Redesigned is cosmetic and doesn't impact gameplay, it is suggested that you put our plugins very early in your load order. This is so that in the event of a conflict, Redesigned will be overridden and won't interfere with your gameplay affecting mods. Advanced users will find the best solution is using Wrye Flash to create a bashed patch. The "Import Faces" function will resolve any conflicts with Redesigned. Users of Redesigned HD should use the "Import Races" function as well. 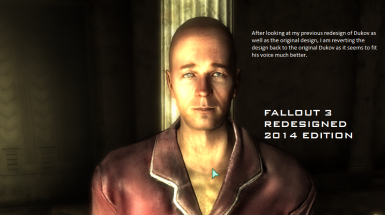 I am not currently doing designs for FO3, but SpaceOden is still maintaining the mod. If you have any bugs to report please post them in the bugs section. 1. Is this mod just a "Barbie-doll" or "celebrity" mod that makes everyone in the world look like super models? The title of the mod is very deceiving. I tried to be creative with the title but it backfired. But yeah, this is a bit different from your average pretty mod. 2. I'm getting pink eyes or I'm getting pink eyelashes! You have another mod that is using eyelashes and that may be causing a conflict. Try temporarily running this mod by itself and see what mod is causing the conflict. Archive Invalidated isn't working correctly. Sometimes unchecking it and then checking it will fix the problem. 3. Ok, I've downloaded everything. I installed everything correctly, but I'm getting characters with white faces but black skin. Verify that you downloaded ArchiveInvalidation Invalidated. That should fix the problem. 4. Will this work with body mods? This will work with most body mods, because this is a face mod. It should work with Dimonized Type 3, Malos, Type V, etc. 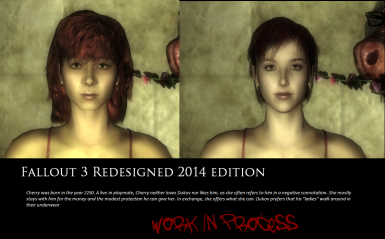 But it will not work with other face mods, such as Josef Grey's makeup textures or Dimonized faces. 5. The game crashes before I even get to the main menu! That's a missing master error. 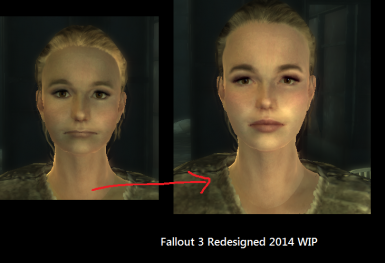 Please re-install your body mod after the HD resources. That should solve your problem. Post in the comments section or send SpaceOden a PM. 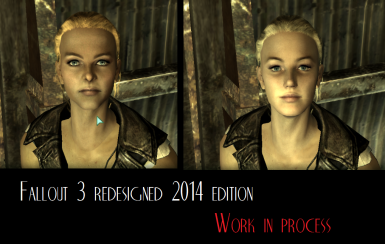 For some of my most recent work, check out my mod for Fallout New Vegas.